What can I say about Tequila? We spent two nights in Tequila, Jalisco, in November. 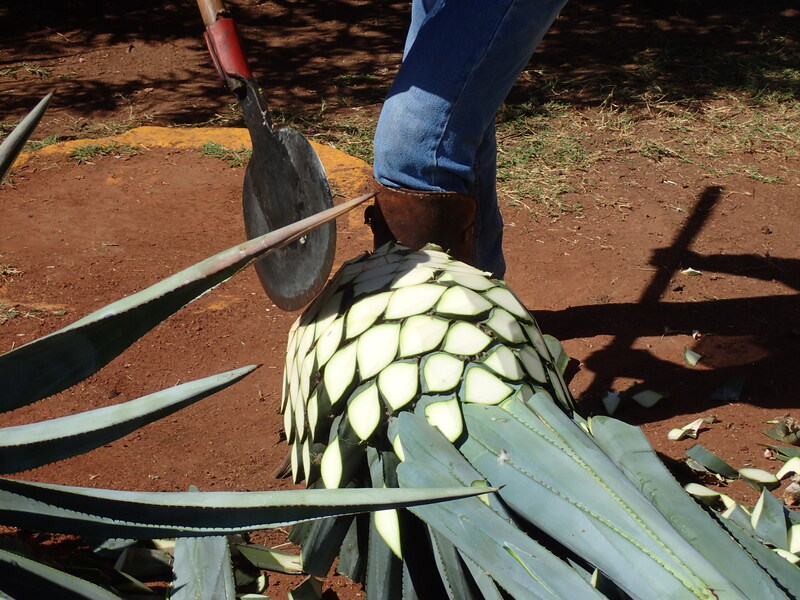 Yes, Tequila is an actual town, not just a bottle you buy at the liquor store. Tequila is a “Pueblo Magico,” as designated by the Mexican government and I can see why. We found it beautiful and charming. It’s surrounding by mountains (including an active (I think) volcano). 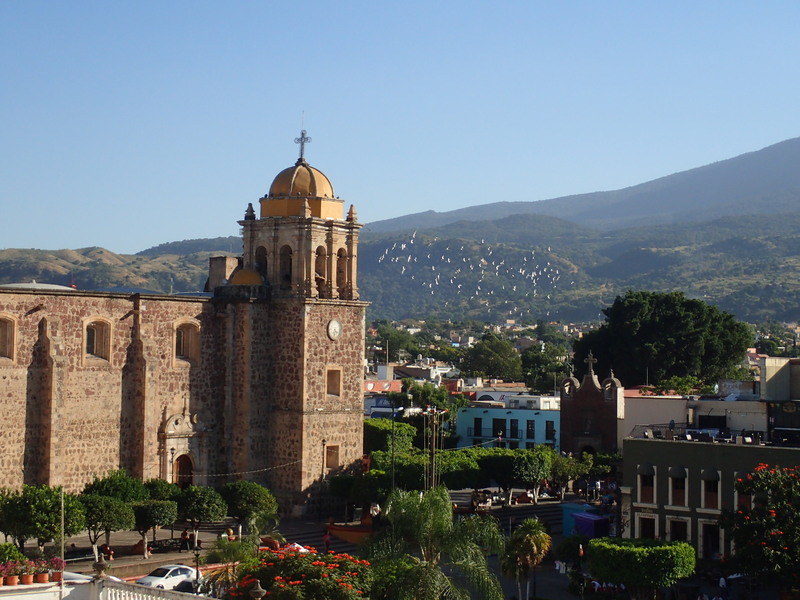 There are lots of historic buildings, it’s very clean, and main plaza is welcoming and fun. Cuervo Distillery has a huge complex called Mundo Cuervo. 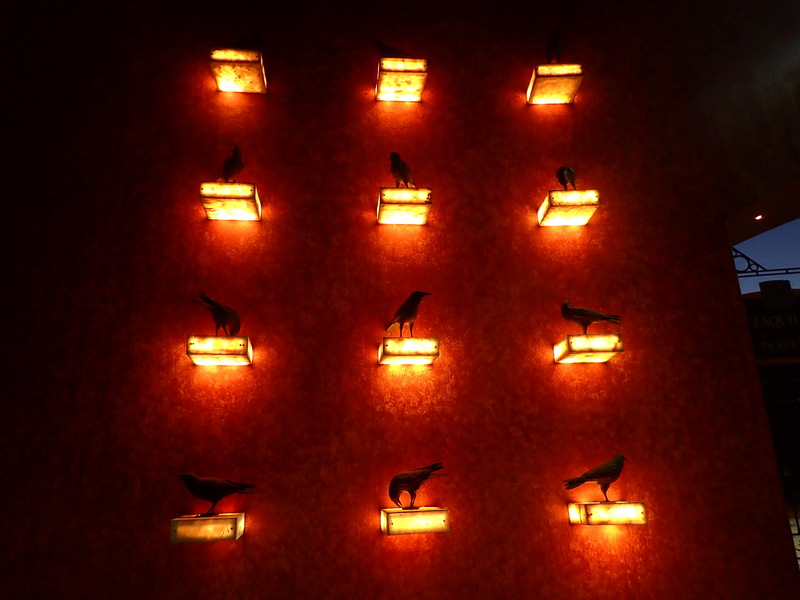 These are their crows at night. 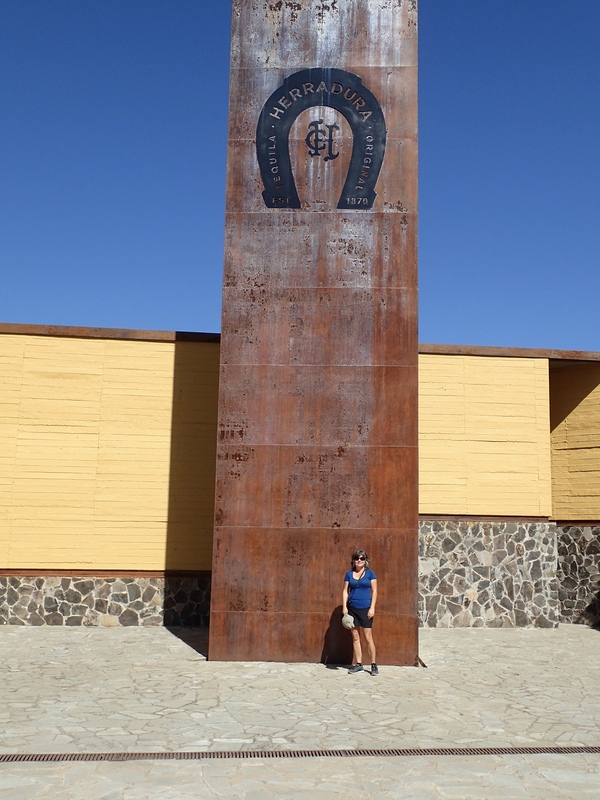 The next day, we drove out to an hacienda to tour the Casa Herradura distillery. The hacienda dates back to the 1700 or 1800s (I’m not so good with dates after a tequila or two) and is a gorgeous walled compound with the original house (off limits to us tourists, still used by the family), the original distillery (more on that later), worker housing, and the current distillery and related buildings. Our tour guide was cute (hey, a woman can LOOK) and did an excellent job of explaining everything to us. We saw the huge ovens where the piñas are stacked and roasted for (if I remember correctly), 20 hours. We got to try some slices of the roasted agave piña, yum, kind of like molasses. The roasted piñas are pressed and shredded and the juice is pumped into big open fermentation tanks. Unlike most places, Herradura uses wild yeast. For a homebrewer/beer geek like me, this was interesting! Who knew?! We toured the distillery (tequila is distilled three times) and then the barrel room. 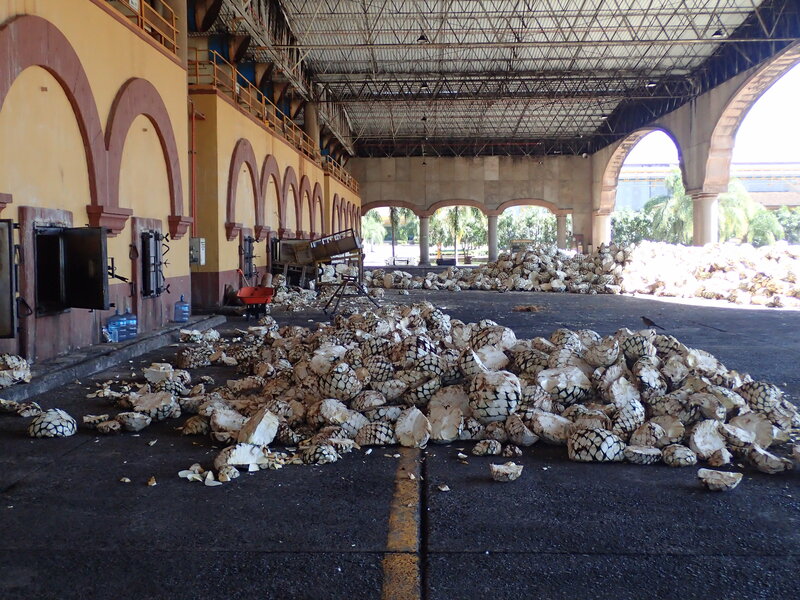 Reposado and anejo tequilas all spend time in American Oak barrels, a practice started by Herradura in the 1970s. One of the coolest places on the tour was, alas, forbidden to photograph: the original distillery from the 1700 or 1800s. Stone vats in the floor for the liquid, a big grinding stone that he been pulled by horses to crush the roasted piñas, and the electricity that was added via a steam engine in the early 1900s. This factory was used untilthe 1960s. I highly recommend this tour and seeing this for yourself! A fun find in the town of Tequila was the La Cata tequila bar. They have about 200 bottles from which to choose and the bar staff can give you an advanced education about tequila — the producers, the flavors, the terroir. 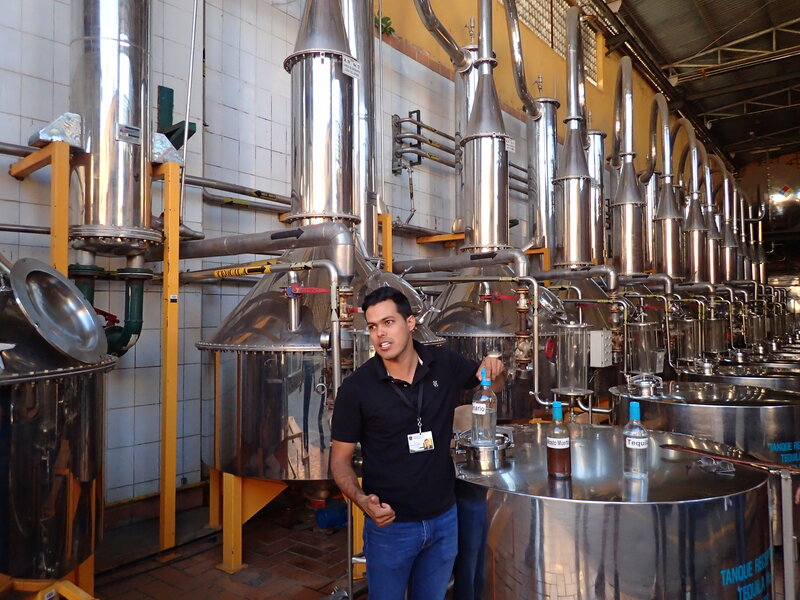 If you visit Tequila, I’d recommend one distillery tour to see the “workings” and then that you head for La Cata to sample and learn. The bar is one the second floor, the space is cute, and the bottles are sparkly. What else do I recommend in Tequila? The Hotel Solar las Animas. First class everything and a refreshing roof-top pool. And restaurant El Jima where you can enjoy a molcajete (even if you’re not a meat eater). This entry was posted in Mexico and tagged Casa Herradura, Jalisco, La Cata, Tequila on December 24, 2017 by czelazek.